No. You Can’t Reserve A Pavilion Table For Tonight’s Fireworks At 9:30 A.M. Please Stop. It’s one thing for Westporters to come early, stake out huge swaths of sand for tonight’s fireworks using chairs and umbrellas, then leave. That arms race started long ago. It’s staking out not 1, but 2, very valuable tables. It’s denying anyone else the use of them for the next 8 or 9 hours. And yes, the red-white-and-blue touch is very patriotic, but come on! Are you really that entitled? Today is the busiest day of the year for our hard-working Parks and Rec crew. But I hope they find a few minutes to free these 2 tables for The People. This entry was posted in Beach, Westport life and tagged Compo Beach, entitled Westporters, Westport fireworks. Bookmark the permalink. Parks Dept? Westport OD? Anyone paying attention? WOW. Why doesn’t Wepo Parks & Recs simply strip those tables clean? If someone’s got the tables, but they’re not there for an hour (whatever seems reasonable) – pack it up!! I don’t mind the early birders but at least have the decency to be there and use the facility/tables. One person out of a crowd of 50 can certainly pull that off. Even knuckleheaded frat boys figure that out when camping out for tickets & games? The dark side of Westport Fourth. I’m guessing they’ll be blaring crappy music later tonight too! Typical Westport entitlement. I’m surprised they didn’t park their car there. desire for control. Sadly, this is a sight as with many that exist in our town. Holy cow. I’d be nervous to leave my pets unattended if I had these people as neighbors. Maybe they’re coming back for brunch at 1030. Wonder if that s… floats?! This reservation should be removed immediately with a note saying pick up your tarp July 5 .There should be a large billboard stating no reservations for the fireworks until the beach reopens for the fireworks at 5pm with a person .physically present All other reservation paraphernalia will be removed immediately.This type of entitlement is out of bounds and unexceptable. When I was growing up in Westport we would stake out for the 4th but in shifts starting at 6AM. But unlike these people we had a fantastic fun day . We cooked. Did some water skiing…there was always someone at the table area. I loved growing up in Westport!!! Easy solution is to go ahead use the table as is until The Entitled return to claim their stuff. Course you would have to move that rock around. A lot. You in a shy mood? From the P&R Web site, under “Picnic Rules and Regulations”: “Reservation of picnic tables is prohibited.” Doesn’t get much clearer than that. Let’s see some photos tonight of the people in their “reserved” placers. I’m thinking about wrapping the cannons with plastic and ribbon so my family can sit on them during the fireworks…oh, and part of the jetty too. Too late, Bob. My imaginary friends and I already did it! Thought there was going to be a police officer on duty. Can’t he do something? This is way out of bounds. By removing the intended permanently wrapped real estate does that count as the “Westport Teardown Of The Week”? Looking in the background there seems to be another area staked which looks to be, what, 25′ x 20′? Another vast bit of Compo real estate. Is it true that Home Depot is sold out of their 60′ x 40′ tarps and that they can all be found here? 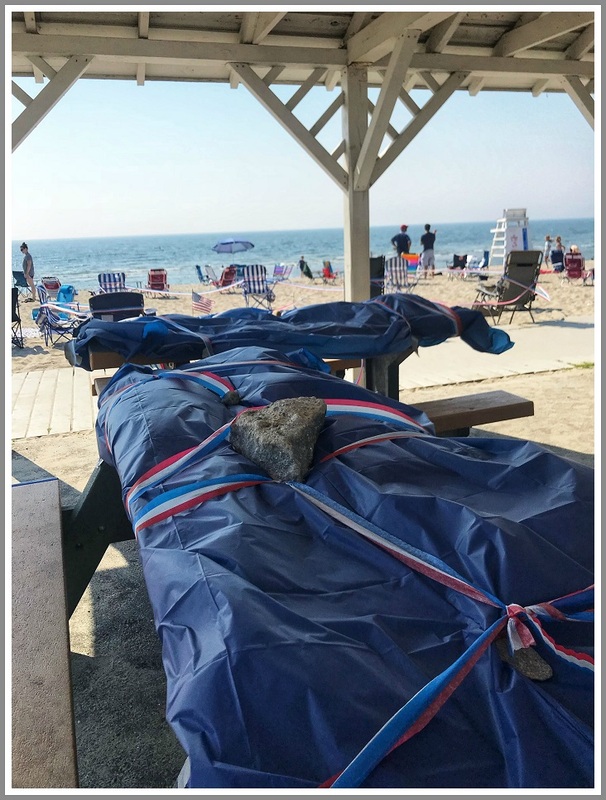 As noted on the Westport Parks and Recreation Department website under Beach Policies and Procedures, the “reservation of picnic tables is prohibited.” Staff are patrolling the beaches and removing items from tables in violation of this rule. We hope everyone has a safe and enjoyable time at tonight’s fireworks. I use to go to the fireworks but now people are so rude that it’s not enjoyable. They stake out a large area on the beach and then disappear until much later in the afternoon. People can’t enjoy the beach for the day because there isn’t room. Families with working parents who can’t reserve their spot come to the fireworks only to find no place to sit. I remember when they use to clear out the beach in the afternoon and then let families come in before fireworks. Now if your not down there in the AM staking out half the beach, you won’t find a spot. That’s more than rude since today is such a hot day for the people that went to the beach during the day today. Shade is very welcome on a day like today. I’m glad to hear they are enforcing the no reserving tables rule! Hooray for the folks at Parks and Rec! Thank you for all you do for our town. And thank you Dan for helping to make things right. I wonder if it’s worth making a few signs for the pavillion areas clearly stating that reserving tables without people in place is prohibited and also not in keeping with community spirit? Happy 4th (and 2nd) everyone! I volunteer to remove it! Maybe put a sign on it “reserved for rec volunteers” or something with REAL generosity. Good catch Dan ! If you leave your “stuff” behind isn’t that littering? Someone should get a ticket.